First I must say that I am a huge fan of SPG properties. This past weekend I had to travel to Los Angeles for a funeral. When thinking about places to stay, I normally tend to stick to SPG (now Marriott) properties. 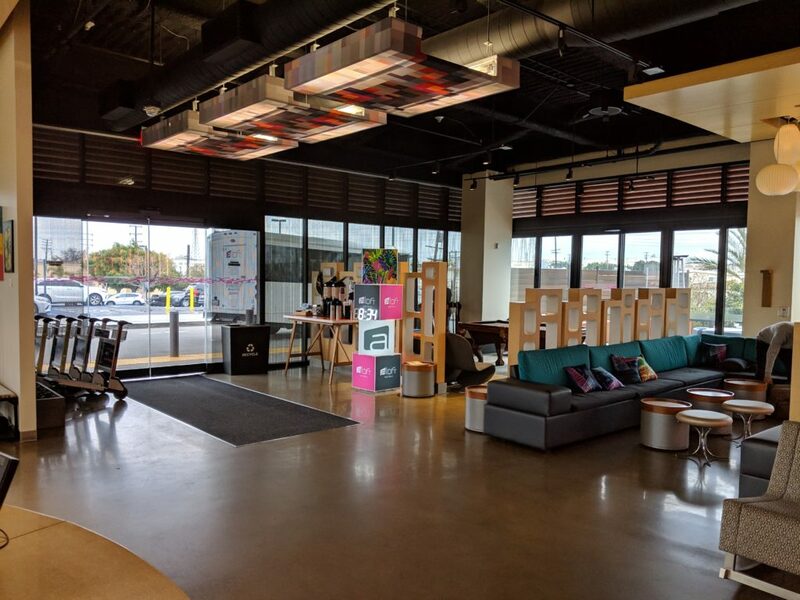 Aloft Hotels are part of the SPG family and I thought I would give it a shot. 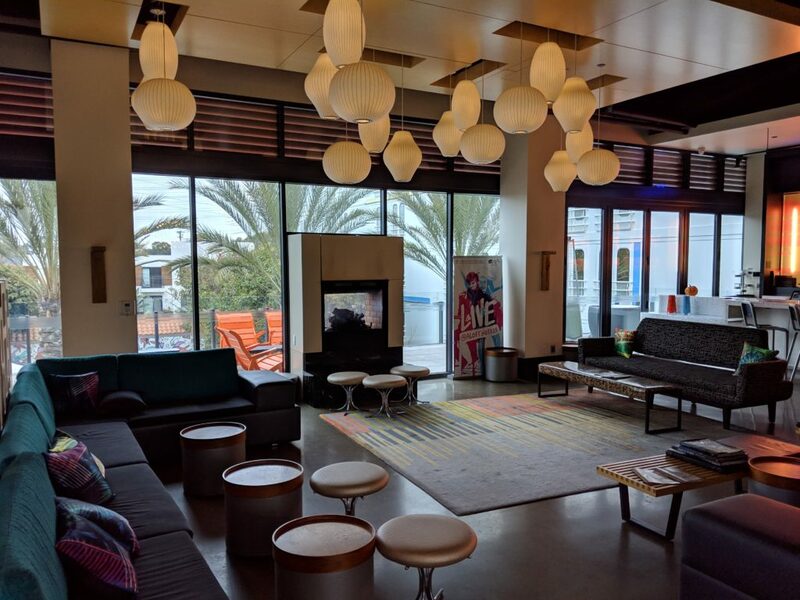 Is the Aloft Hotel El Segundo in LA good or bad? Let’s find out! As you can see I have different options as to how I want to pay for a room. 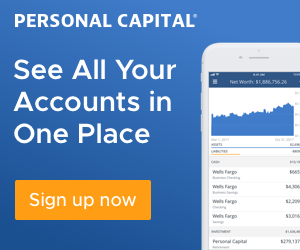 Booking can happen by either calling or using the SPG app on my phone. A notable gain being a Gold Member is I automatically get a room upgrade to what is available. It’s pretty awesome! 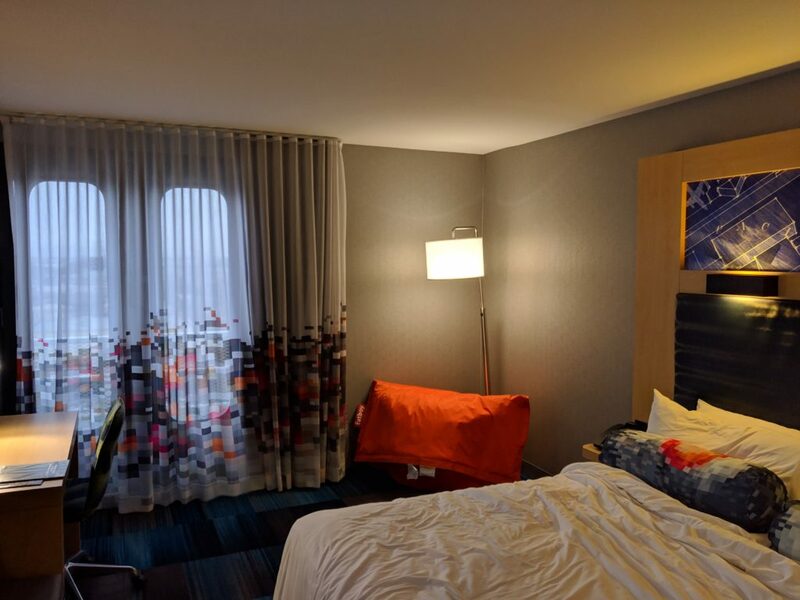 Ok… on to the Aloft El Segundo. 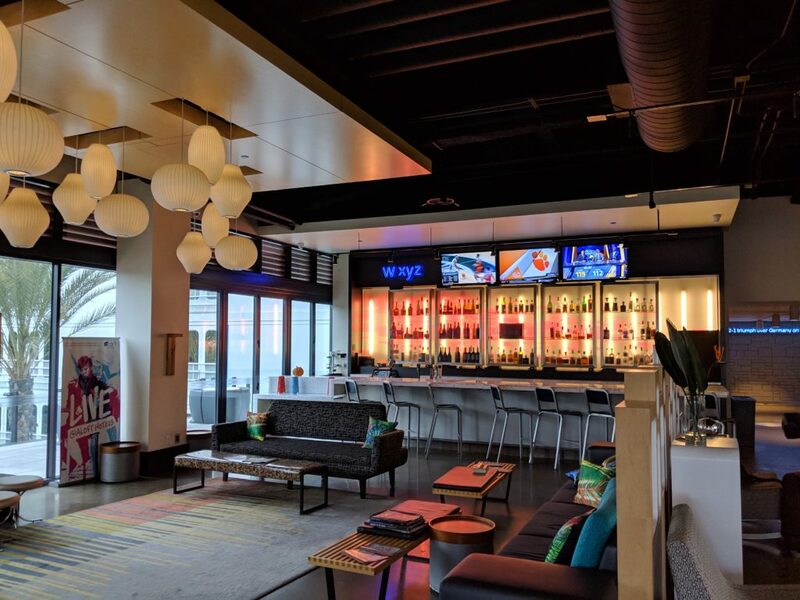 The entrance to the Aloft is through a lounge they call “WXYZ”. It’s exactly what you think it is. A lounge with a bar, fireplace, pool table, etc. It is well lit with a great color scheme and live music some nights. The hotel staff is amiable and the wall of alcohol would rival any club. The vibe of this space is very modern and it literally looks like a VIP spot you would spend at least $30 to get into Hollywood. It is very well kept and even the luggage carriers at the front door don’t interfere with all that is going on. Over in the corner is a pool table and space to have a lot of fun with plenty of trash talking. Here are some additional pictures to help tell the story. 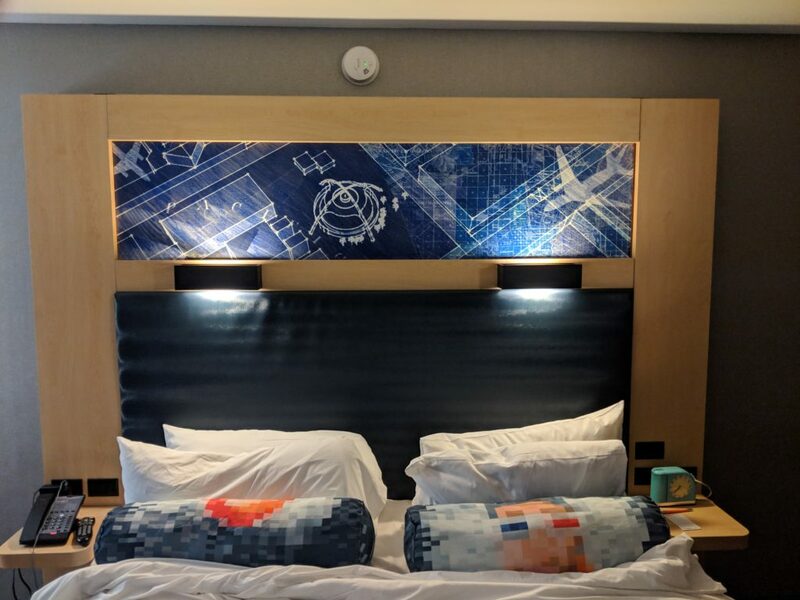 After my great experience checking in and the excitement of the WXYZ lounge, I went to my upgraded room on the 9th floor (the top floor). 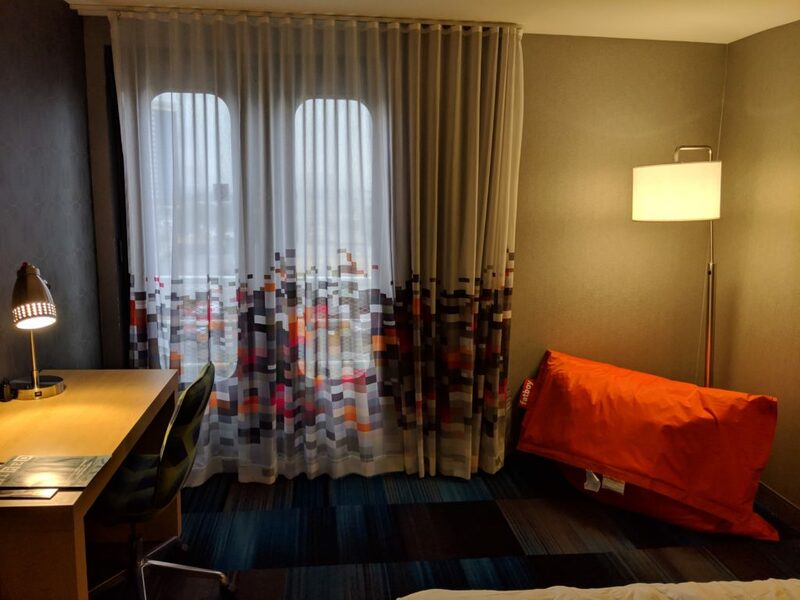 There, was a great view, the room was clean, and they even had doors that are in place of windows that open to allow for airflow. It also included a “Fatboy” bean bag that I thought was pretty neat. Under the TV mounted on the wall, there was a long comfy bench, and there were also plenty of easily accessible outlets and USB plugs which made life good. 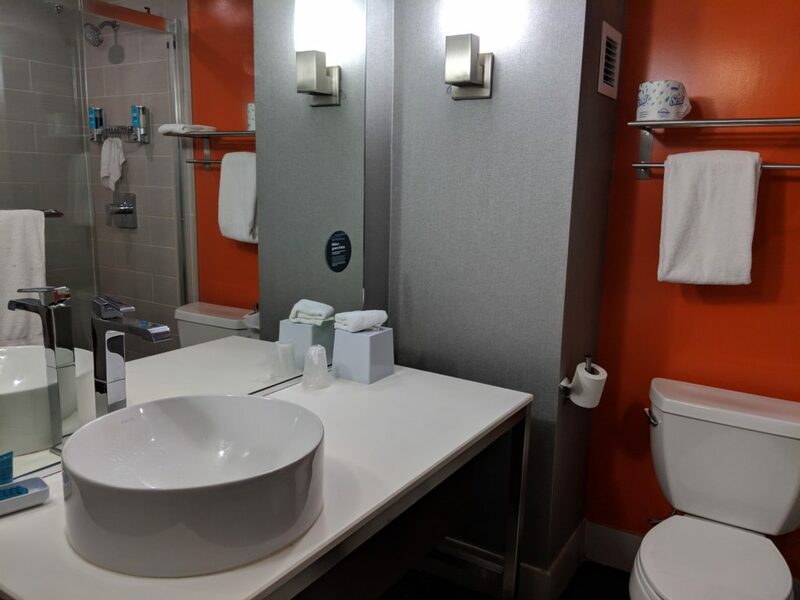 The bathroom looked like something you would see in a modern design on HGTV. 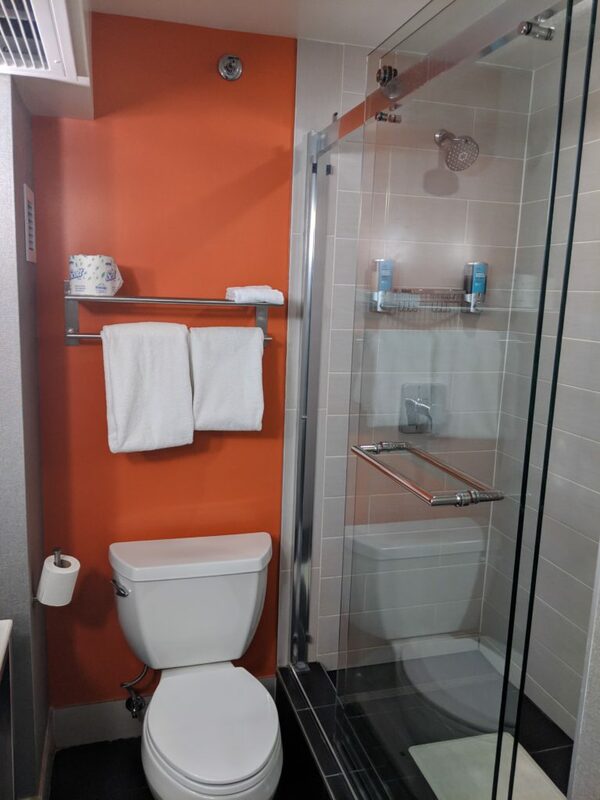 The shower was raised a few inches from the floor with fancy sliding glass doors. Little items like the drain in the shower were really nice. They had vertical slats where the water would drain that spanned from left to right of the shower. I was only in town for 2 nights and it wasn’t all bad however, the first night I noticed something odd. The air unit would not produce any heat. Now hold up! I know we are in Los Angeles but we are by the beach so it gets kinda cold at night this time of year. NOT cool, so I called down to the desk to see if they can have someone fix it or move me to another room. When I got a rep. on the phone, I was told “…our rooms only blow cold air and not heat. We can bring you a space heater if you’d like?”. I was tired and cold so I agreed. The space heater was pretty used and did work for the most part. I don’t know if they have filters or anything but if they do, this hotel should make it part of their maintenance plan to clean them. My room smelled like old dust and other people. It even got to the point where I had to run it and then open the door to get fresh air. Eventually, I just dealt with it as best I could. This was something I DID NOT expect to deal with when it comes to an SPG property. Within 24 hours I received an email from the Hotel Manager. He was very polite and explained to me that the building was old and had been renovated by Aloft Hotels. One of the issues they have been having being the HVAC system is old and it takes a lot of time, effort, and cost to switch the units to heat vs. cold. They’ve decided to keep it on cool due to those factors and issue space heaters for those who request it. Additionally, he did refund the points spent to stay there. Overall it wasn’t a BAD experience, I just say this as a stupid problem to have. I attribute the way I dealt with this situation partially to reading the book The Subtle Art of Not Giving A F…. I could have gone off, created a scene and all that but it wasn’t worth it. My experience wasn’t “terrible”. Not sure if this is common with Aloft Hotels but it sure is here. Let me know your experience with any of these hotel chains and if you’ve experienced anything like this.